Recently I got to thinking that there is something definitely wrong with the Airstream travel world of yester year. For some odd reason, my telephone rarely stops ringing from folks calling from those states East of the Mississippi river. Far too many calls were made by Airstream lovers who were frustrated by the fact that they couldn’t locate trailers (vintage) to buy! Areas like the Northeast or Coastal USA locations (where Airstream had little presence seemed distinctly a problem.) Trailers that were advertised “FOR SALE” in classified ads or on the internet anywhere close to the heartland of America also had challenges. I almost scratched hair off of my scalp trying to figure the anomaly out. Then in a moment of genius I came up with a “logical” reason!! 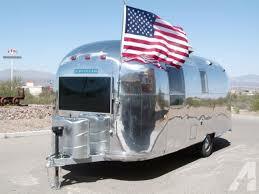 Airstream production started manufacturing in the West, specifically California, not the Northeast. When the recent boom of Airstream interest occurred, half of the country didn’t know the movement was on. For that reason alone, most backroad travelers never knew the movement and exciting lifestyle was on the move. I, and plenty of others, seemed to have very slowly recognized so many more TV commercials with Airstreams in all different outdoor back drops but more importantly there were so many Western USA commercials made that the niche is now in a boom (both in price and sheer numbers on the road. Eventually we are seeing the immense enthusiasm for the outdoors with Airstream leading the pack even now as far East as spots like BOSTON!!! !